The distribution of employment in New Jersey has changed dramatically since 1980, in ways that create cause for concern. Many of New Jersey’s job centers of the past have declined in importance, eclipsed by new clusters of suburban office parks. Most of the newer job centers are not accessible by public transportation, meaning that each of their workers represents an additional car on the road, adding to congestion. The number of major workplace destinations has swelled over the last two decades, with the resulting dispersed job distribution pattern producing a seemingly omnidirectional rush hour and inhibiting future transit service, which relies on the spatial concentration of activity. Worse, some older job centers with good transit access have actually been losing jobs, reducing the number of people who have the option of commuting by means other than their car. Many of the most serious job losses have taken place in urban municipalities that are already plagued by a host of socioeconomic challenges; these places can ill afford rising unemployment or a declining tax base. As jobs have spread out, they have also tended to shift away from transit-accessible locations and toward automobile-dependent ones. Consider the difference between the 20 municipalities that experienced the greatest private-sector job gains between 1980 and 2003 and the 20 municipalities that lost the most jobs over the same period. In the 20 biggest job-losing municipalities, 11.7 percent of workers commuted by transit, 5.6 percent walked to work, and only two-thirds (67.9 percent) drove to work alone. In contrast, the 20 biggest gainers had a 7.2 percent transit ridership rate and 3.9 percent rate of walking to work. But the difference becomes much more dramatic when Jersey City – a rare example of an older, transit-accessible job center that actually gained jobs since 1980 – is removed from the analysis. The other 19 largest job-gaining municipalities together had only a 4.0 percent transit ridership rate (one-third the rate of the job losers) and a 2.9 percent rate of walking to work, while 81.7 percent drove alone. If New Jersey continues to scatter its employment sites to suburban locations accessible only by highway, it can expect congestion to get worse, possibly even to the point of discouraging potential employers from locating here for fear of not being able to attract employees who are put off by the prospect of long commutes. New Jersey already has the nation’s third-longest average travel time to work, at 30 minutes as of the 2000 Census. (Mid-decade estimates indicate that New Jersey continues to hold its high ranking.) This represents an increase of 4.7 minutes over the 1990 average – the third-largest increase in the country for the 1990s. Commutes are longer in New Jersey than in most of the rest of the country, and getting longer faster. The redistribution of employment away from transit is simultaneously creating undesirable effects in several other public policy arenas. It is contributing to the plight of older urban centers by depriving them of jobs that could help their residents break the cycle of poverty and unemployment. And it is undermining state policy goals regarding the reduction of greenhouse-gas emissions, since every new job created in a car-dependent office park means one more car on the road, emitting more CO2. These problems are avoidable. By steering jobs back to transit- and pedestrian-friendly locations, New Jersey can get commuters out of their cars and onto trains and buses (or onto the sidewalks), thereby reducing congestion, per capita energy consumption and greenhouse-gas emissions. This recentralization strategy would also give a much-needed economic boost to some of the state’s struggling urban areas by creating employment opportunities where they are most needed and by shoring up these municipalities’ commercial tax bases, generating revenues that could be used to improve local services. New Jersey is well positioned to execute such a strategy – it is blessed with an extensive rail transit system that is the envy of the rest of the country. And experience has shown that if good transit service is available, people will use it, especially for traveling to work. As of the 2000 Census, 70.6 percent of New Jerseyans working in Manhattan rode public transportation to work, as did 24 percent of those who worked in Philadelphia. At the same time, only 5 percent of people who work in New Jersey use transit to get to work; this is no better than the national rate of transit commuting and clearly leaves room for improvement. 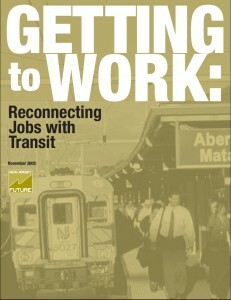 With its existing transit network and a population already more inclined to ride transit than in most of the rest of the country, New Jersey ought to be able to improve its intra-state transit commuting rate; what is needed is a coordinated effort on the part of state agencies to make transit hubs the default choice for companies seeking to relocate or expand in New Jersey. Identify stations with the greatest potential to serve as transit-oriented employment hubs. Incentivize development in candidate municipalities. Reorient state-level employer recruitment programs to encourage large employers to locate near transit stations. Expand and improve the public transportation system. Level the playing field between transit and driving. Make the reduction of vehicle miles traveled (VMT) – and the expansion of transit ridership – explicit goals of state efforts to curb greenhouse-gas emissions.